The Star Wars fan community is trying to come to terms with, and understand, what led to the decision to change directors on the upcoming untitled young Han Solo A Star Wars Story film. 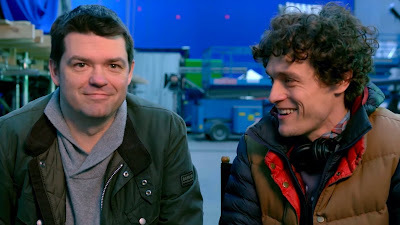 Earlier tonight, Lucasfilm announced in a press release that "The untitled Han Solo film will move forward with a directorial change" and that directors Phil Lord and Chris Miller had exited the project due to "creative differences." Directorial changes are not uncommon in Hollywood and happen on a semi-regular basis before film's go into production. What makes this change so strange is that the Han Solo film had already been filming for close to six months. The question on all fans minds is why did this happen? The general consensus seems to be that Lord and Miller's vision didn't quite line up with the producers vision of the film, which led to tension that plague the whole shoot. Variety reported that, "A person with knowledge of the production said that the chemistry between the directors and Kennedy was never right," and that there had been tension since the beginning. A source told Variety, "(Lord and Miller) weren’t given the leeway to do what they had to do." "The friction was felt almost immediately into shooting, sources say, but the directors always thought it would be worked through. Kennedy, the producer and head of Lucasfilm, decided to back her lifelong colleague, who shaped much of Solo’s character in Empire and ‪Return of the Jedi and who had a specific tone in mind for the new movie. The duo also didn’t feel they had the support of producer Allison Shearmur, who was acting as Lucasfilm’s representative on the London set." They also add that one source claimed that Lord and Miller were "blindsided by the firing" which they only learned of on Monday, however this claim was "disputed" by another source. Regardless, Variety makes it clear that the decision for Lord and Milller to leave the project was not a mutual decision as the press release might have you believe. They report that, "The directors did not leave the production voluntarily, but were fired by Lucasfilm." The next question that fans are asking, as I'm sure Lucasfilm is too, is what happens next. Ron Howard is reportedly the front runner to take over the directing duties, with Lawrence Kasdan and Joe Johnston also in the mix. Whoever it is will, according to THR, "take the next several weeks, as the production shuts down, to go over what Lord and Miller have shot, re-edit what they’ve shot, 'and go from there.'" Variety adds that several weeks of reshoots are already planned. This would not be the first time a Star Wars film has needed extensive reshoots in the last few years. Just last year, the story that wouldn't go away surrounding Rogue One had to do with the reported six weeks of reshoots that reportedly came as the result of Lucasfilm and Disney executives being unhappy with director Gareth Edwards' first cut of the film. In that case, Tony Gilroy was brought in to write new scenes and oversee the reshoots, working with Edwards to complete the film. (For those wondering if Gilroy might be in the running to take over the Han Solo film, Variety checked with his representatives and they said he was not). In the case of Rogue One, the reshoots had to do with fixing the tone of the film. When it comes to Han Solo, it appears it was the man himself that was the source of the tension. THR reports that the directors and the producers did not share the same vision of who Han Solo is as a character, and it is implied that the directors were making him funnier than Lucasfilm executives wanted (Kennedy has been previously quoted as saying the film had, "closer to a heist or Western type feel"). Obviously, there is a lot of uncertainty and a lot of unanswered questions about what went down here. My main question is how Lord and Miller were allowed to shoot so much of the movie before a decision was made. And if this "friction" existed between them and Kennedy or Kasdan from the beginning, why were they even able to start shooting the movie at all? Also, how does the cast feel about this? If the source of the tension really was over who Han really is, what does this mean for star Alden Ehrenreich? It seems highly unlikely they would remove him from the film, but it does raise the question about how much will he have to change his portrayal? And for the rest of cast, how does this affect them and their portrayals, let alone their schedules that will likely have to changed to accommodate the reshoots? There's a lot of questions and a lot of uncertainty surrounding this film, and who's to say if we'll ever really know the truth. In the meantime, we have the announcement of a new director to look forward to and speculate about. Then, who knows what we can actually expect when the film opens in theaters next year.